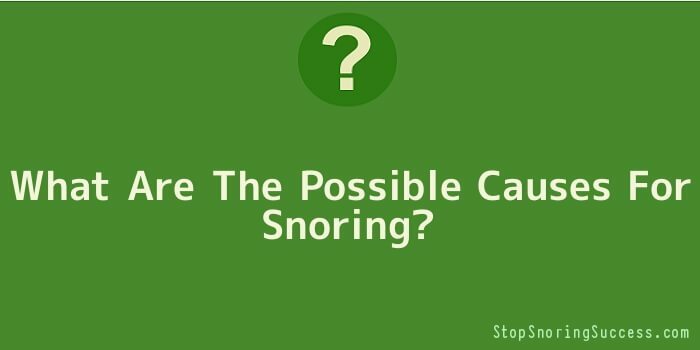 What Are The Possible Causes For Snoring? If you are subject to night-time elbow kicks, and your significant other gives you an annoyed look every time when you wake up, then you probably have a snoring problem. Snoring is an extremely annoying habit that can cause you huge embarrassment, and even deprive others of their precious and peaceful slumber. This problem would look pretty innocuous, and people may even laugh about it. But mind you, snoring is no laughing matter. On the contrary, it is extremely serious, enough to trouble your relationship. Snoring puts a tremendous strain even on the healthiest of marriages. Snoring can also be a symptom of some much more serious health problems. Therefore, think twice before joking about it. Snoring is actually caused by a physical obstruction to the airflow through the nose and mouth. There are many reasons for this blockage, such as a soft palate, tonsils, sinuses, allergies, a long uvula or excessive flabby tissue at the throat. When these areas relax during sleep, they cause the blockage resulting in snoring. If we are successful in keeping the airway open, then air can travel more slowly, thus reducing the throat vibrations and eliminating the snoring problem. The most common cause of snoring is a tongue muscle that gets too relaxed during sleep. Then it is sucked back into the throat each time you breathe. Sometimes, snoring causes are not quite clear. This is because snoring and heavy breathing can also be a sign of sleep apnoea. Sleep apnoea is a very serious and potentially life threatening condition, which can be associated with snoring.